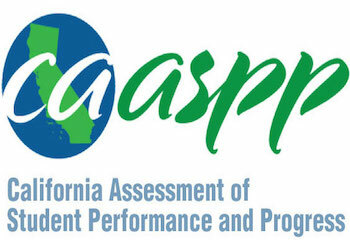 The California Assessment of Student Performance and Progress (CAASPP) is California's new system of state assessment, the science assessments and the Alternate Assessment. CAASPP replaced the Standardized Testing and Reporting (STAR) Program in January 2014. The Smarter Balance tests are given annually in Math and English Language Arts in grades 3-8 and 11 and are structured to be taken online for a more interactive test experience. The tests are also designed to provide educators with a deeper understanding of how students learn. Each CAA is administered on a one-to-one setting by the student's teacher. Teachers and students have the opportunity to use the CAA training tests to gain experience with different types of questions and performance tasks. New grade-specific practice tests are now available for ELA and mathematics that allow parents, teachers, and students to become familiar with using the various embedded and non-embedded resources to establish the best possible setting for the student's testing experience. The CAAs for ELA and mathematics are given in grades three through eight and grade eleven. The ELA and mathematics tests are delivered online and are stage adaptive, adjusting to the student's performance at selected points during the administration. The CAA for Science is administered to students in grades five and eight and once in high school (tenth) who meet the one percent eligibility threshold. The CAA for Science will be administered as an embedded performance task that is part of classroom instruction. Exact times and dates within the window vary. Please contact your child’s school for additional information.